In the Scientific American May 2002, Peter Libby pointed out that as recently as 10 years ago, most physicians described atherosclerosis as a straight plumbing problem: Fat and cholesterol gradually build up on the surface of passive artery walls. If a deposit grows large enough, it eventually closes off an affected "pipe," preventing blood from reaching its intended tissue. Few believe that explanation anymore. Investigations begun more than 25 years ago have now demonstrated that arteries bear little resemblance to inanimate pipes. They contain living cells that communicate constantly with one another and their environment. Most heart attacks and many strokes stem from less obtrusive plaques that rupture suddenly, triggering the emergence of a blood clot, or thrombus, that blocks blood flow. In early atherogenesis, recruitment of inflammatory cells and the accumulation of lipids leads to formation of a lipid-rich core, as the artery enlarges in an outward direction. If inflammatory conditions prevail, proteinases secreted by the activated leukocytes can degrade the extracellular matrix, while pro-inflammatory cytokines such as interferon- (IFN) can limit the synthesis of new collagen. These changes can thin the fibrous cap and render it susceptible to rupture. When the plaque ruptures, blood coming in contact with the tissue factor instigates thrombus formation, leading to acute myocardial infarction. 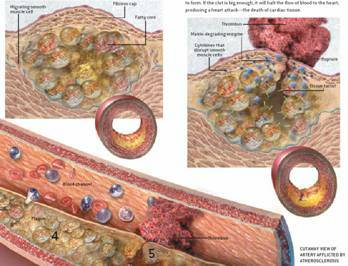 The research has, moreover, established a key role for inflammation in atherosclerosis. This process-the same one that causes infected cuts to become red, swollen, hot and painful-underlies all phases of the disorder, from the creation of plaques to their growth and rupture. When microbial invaders threaten to hurt us, inflammation (literally meaning "on fire") helps to ward off infection. 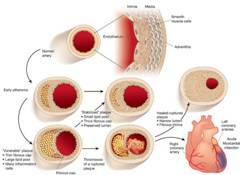 In the case of atherosclerosis, though, the inflammation proves harmful. In other words, our own defenses bombard us with friendly fire, just as happens in more famously inflammatory conditions, such as rheumatoid arthritis. Abnormalities in the connective tissue component of the vessel wall have been implicated in the genesis of atherosclerosis and its complications. Connective tissue integrity depends on a balance between degradation and repair of extracellular matrix. A family of enzymes known as the matrix metalloproteinases (MMPs) plays a major role in the degradation of collagen and other extracellular matrix macromolecules. An important mechanism for the regulation of the activity of the MMPs is via binding to a family of homologous proteins known as the tissue inhibitors of metalloproteinases (TIMPs). Under normal circumstances, the TIMPs are in delicate balance with the MMPs, and matrix is digested in a highly regulated fashion. The MMPs are members of a family of proteinases secreted in zymogen form characterized by tight binding of zinc ions to their active sites. They are able to degrade extra-cellular matrix, including collagen, gelatin, elastin, fibronectin, proteoglycans, and have been implicated in wound healing, vascular remodeling, plaque rupture, inflammation and cancer. However, during certain disease states, including atherosclerosis, there is an imbalance between the activities of these 2 families of proteins leading to tissue destruction, and possibly rupture of a coronary artery atherosclerotic plaque. The MMPs and the TIMPs, through their combined net effect on proteolysis, are now believed to play a critical role in extracellular remodeling during all phases of atherosclerosis, from its genesis and progression to the development of its acute complications. Furthermore, because these proteins are synthesized in response to cytokines, they may serve to link inflammation and atherosclerosis. The aim of Dr. Marmur and colleagues' study was to determine if an MMP and its inhibitor could serve as predictive biomarkers for outcomes in patients with coronary artery disease (CAD) and to compare their value in this regard to other established biomarkers. To this end tissue inhibitor of metalloproteinase-1 (TIMP-1) and matrix metalloproteinase-9 (MMP-9) levels, along with a number of other established biomarkers, were measured in 389 male patients undergoing coronary angiography at a Veterans Administration Medical Center . The patients were then followed prospectively for the occurrence of all-cause mortality, cardiac mortality, and myocardial infarction (MI). Results : Follow-up data at 24 months were available for 97% of the patients. 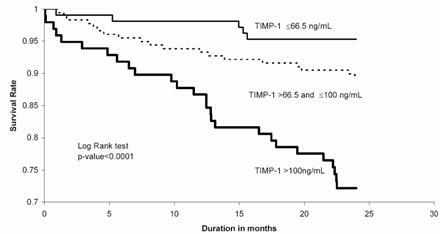 For the entire cohort of patients, TIMP-1 was the only biomarker to independently predict all-cause mortality and MI. In addition, the ratio of TIMP-1 to matrix metalloproteinase-9 was independently predictive of cardiac mortality at 24 months. Odds ratio for all-cause mortality at 24 months. The 24-month survival rates for patients in the lower quartile (<66.5 ng/mL), interquartile (66.5-100 ng/mL), and upper quartile (>100 ng/mL) of plasma TIMP-1 values were 95.3%, 89.3%, and 72.2%, respectively ( P < .001). Furthermore, when patients with chest pain were risk stratified into those with and without an acute coronary syndrome, TIMP-1 remained an independent predictor of all-cause mortality in both subgroups. Kaplan-Meier curves for all-cause mortality according to base-line TIMP-1 stratified by the lower (<25th percentile), inter- (25th to 75th percentile), and upper (>75th percentile) quartile values. 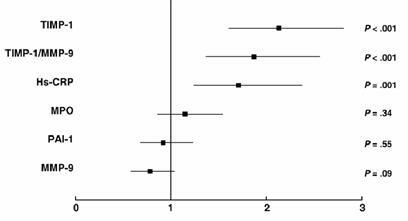 Conclusions : In a cohort of male patients undergoing coronary angiography, a single baseline determination of plasma TIMP-1 is independently predictive of the subsequent risk of death and MI.